Last year marked th 100th anniversary of 2 of my favorite states joining the union and the United States Post Office was right on track by issuing commemorative stamps. Arizona became the 48th state on Feb. 14 1912. “The Grand Canyon State” is home to 21 Native American tribes with ancient connections to a land known for its stunning beauty and abundant natural resources. The end of the Mexican – American war in 1848 resulted in the US acquiring most of present day Arizona. Although Arizona became a U.S. territory in 1863, statehood would wait for almost 50 years more. The discovery of rich mineral deposits drew settlers to the territory, but federal funded irrigation helped turn the mostly arid state into the oasis it is today. More than 6 million people live in Arizona today. A quarter of the state is designated Indian reservation, mostly Navajo, making it the largest in the U.S. 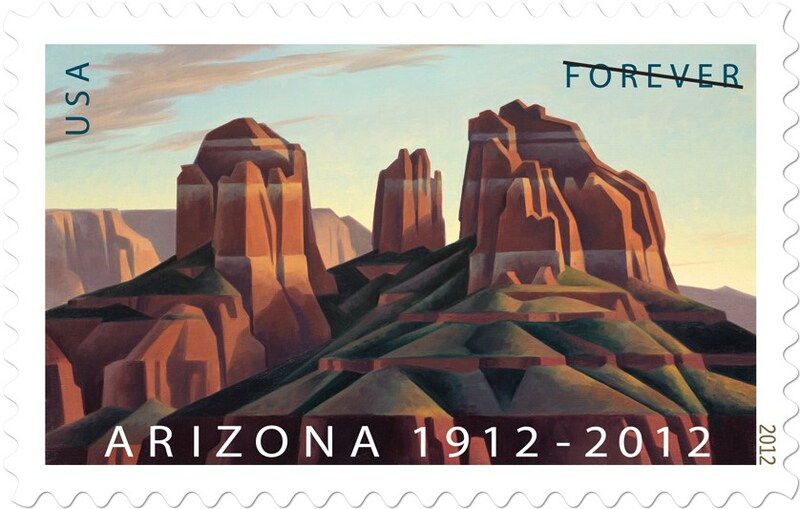 The stamp was designed by Phoenix native Ed Mell. It features the colorful and much admired sandstone formations of Sedona, Arizona. 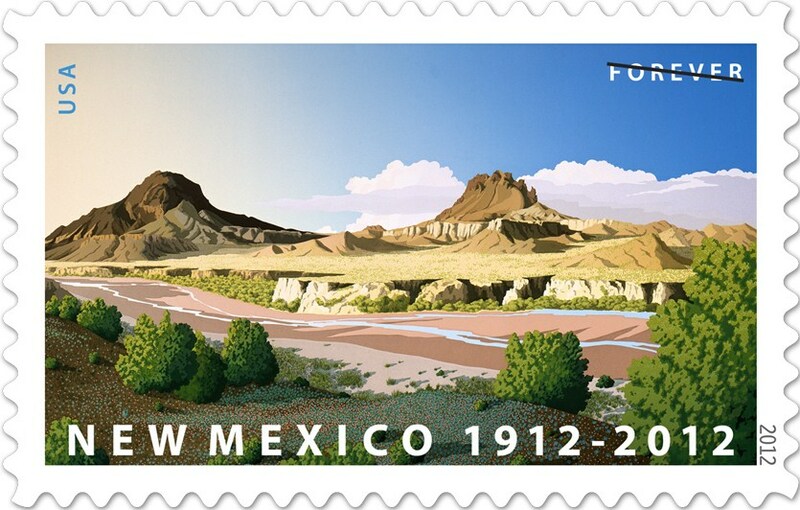 New Mexico, “The Land of Enchantment”, became a 47 th U.S. state on January 6, 1912. Known for its rich history, vibrant cultures, and stunning geographic diversity, today, New Mexico is the fifth-largest state in the U.S. When Spanish missionaries came to New Mexico in the 1500’s, they found the area already settled by the Pueblo and Navajo people. In 1848, northern New Mexico ceded to the U.S. and two years later it was established as a territory. English-speaking cattle ranchers, cowboys, and miners mingled with the earlier Native American and Hispanic residents to create the unique cultural diversity that characterizes New Mexico today. Artist Doug West painted this vision of the New Mexican desert filled with junipers and pinion, the Rio Puerco, and the two peaks known as Cerro de Santa Clara and Cerro de Guadalupe. Head over to the United States Post Office online store a grab a sheet of each. They will mail them directly to you. I love this post!!! Love history facts, along side, with artsy tidbits! And, of course, Arizona, is near and dear to my my heart! Thank you! I am going to share this one with, “the girls”!! I just love your sense of Americana and History. So refreshing and nostalgic. Awww shucks, I have quite an attachment to the lower half of the US …I think that reflects a little in my style. Nice! The last time they did all the states, I framed them for the bathroom that had postcard wallpaper. I think they’re 37 cents, but now I think I’ll just put ’em to good use. Nobody loves the commemorative stamp more than I do! During my last trip to the P.O., I was admiring the Lady Bird Johnson sheet. I love the simple, vintage-ish, graphic illustrations of the Arizona + New Mexico beauties! TY for the post! Kay, the one cent stamps right now are turquoise squash blossom necklaces………way too awesome…..and a shame that no one uses 1 cent stamps anymore.